Only coincidently to do with telecare, but thumbs up to Ken Healey. From The Sentinel [how appropriate!] Staffordshire. PassivSystems: new sensor's heartbeat detection "will revolutionise telecare"
What makes for a successful remote patient monitoring program? Since retiring, Victor Patterson, a consultant neurologist from Belfast, Northern Ireland, has been active in setting up an mHealth service in Nepal for people with epilepsy. In a special report for Telecare Aware he sets out why such services are so vital. If you think telehealth/telemedicine is too easy in the UK and you'd like a real challenge, my advice is to try Nepal. Its population is about 28 million people (only a few of whom are Gurkhas). About 80% of people live outside the capital, Kathmandu, where surprise, surprise, about 90% of the country's doctors live. 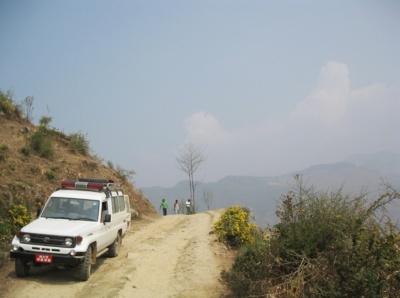 Nepali road - only 2 hours to go!